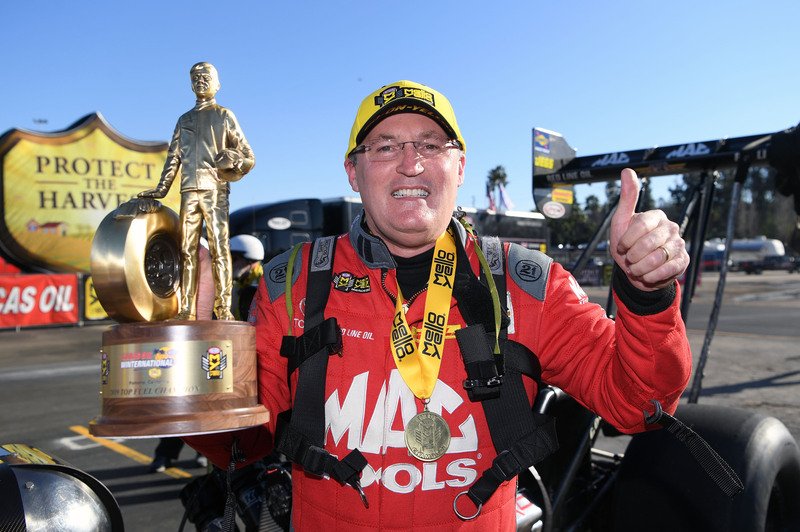 Race Recap: Doug Kalitta and his Mac Tools' team took home the Wally at the Winternationals this afternoon, one year to the day of last year's victory here in Pomona, defeating 2018 Top Fuel World Champion and number one qualifier, Steve Torrence. 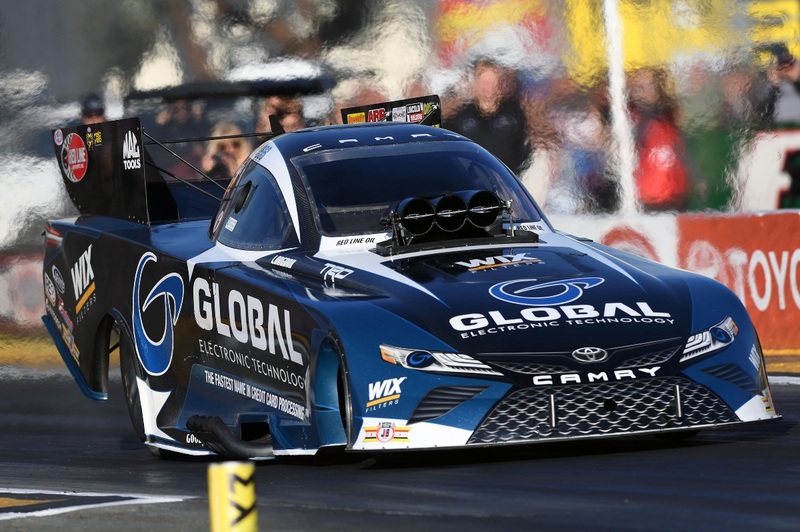 His victory was the first back-to-back win at the Winternationals since Larry Dixon’s wins in 2002 and 2003. Kalitta proved his reputation as one of the best drivers in his class as three of the four rounds won were hole shot wins. Starting in the seventh position with a 3.716 second qualifying pass, Kalitta earned a his 490th race start, ranking him eighth among all pro drivers. His first round match up was with Scott Palmer, who Kalitta held a 14-2 record against. Doug’s .053 reaction time and a 3.707 elapsed time (which was his best of the weekend), sailed past Palmer’s immediate tire smoke. Second round Kalitta faced number two qualifier Billy Torrence. 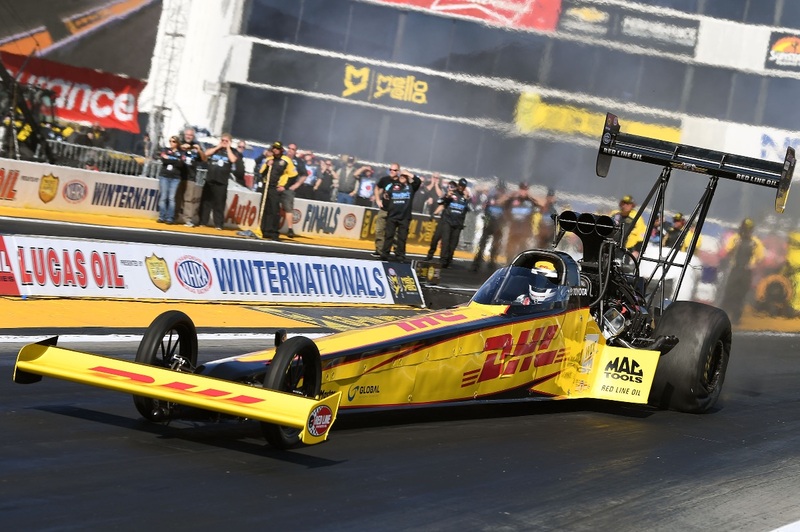 Right out of the gate, Kalitta took the starting line advantage and the power to hold on for his first of three consecutive hole shot victories. The margin of victory was very close .0023 seconds which amounted to approximately 13 inches at the finish line, moving Kalitta to the semi-finals. With another challenging opponent in Terry McMillen, Kalitta powered his Mac Tools Dragster to a 3.708, but that alone would not have gotten the win light. It was his .043 reaction time that helped secure the semi-final win against McMillen’s 3.706, sending Kalitta into his 97th final round. Kalitta looked to earn back to back Winternationals win against his final opponent, 2018 Top Fuel Champion Steve Torrence, who was looking to continue his win streak of 27 round wins. Both cars hazed the tires to make for an exciting race, but it was again Kalitta’s reaction time that defeated Torrence and sent the Mac Tools Top Fuel team to the Winner’s Circle. This win is Kalitta’s 45thcareer win and third Winternationals title. Race Recap: After a stellar qualifying effort throughout the weekend, Langdon carried that momentum into the first round of eliminations. Langdon had a strong reaction time right out of the gate and ran his best run of the weekend (3.930) to defeat his first opponent Jim Campbell. 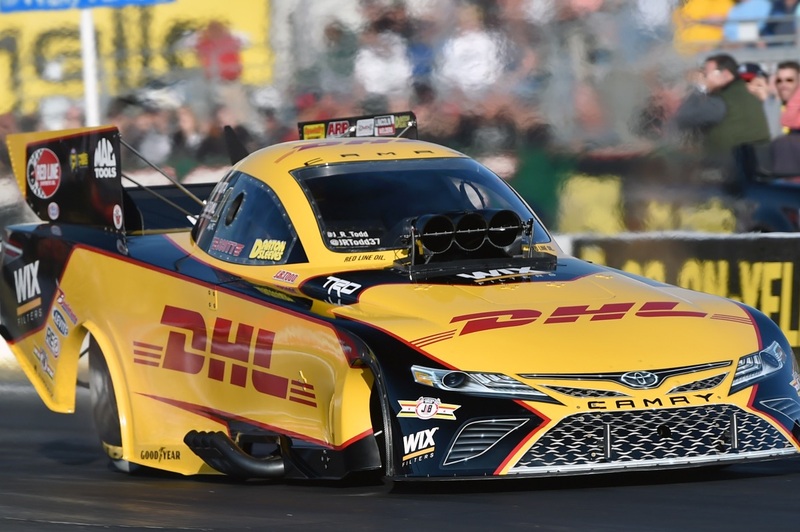 Despite being first off the line and quicker at the 60' mark, the Global Electronic Technology Toyota Camry loses to Tommy Johnson, Jr.
Race Recap: Reigning Funny Car Champ, JR Todd and his DHL team, the "Yella Fellas" day came to a quick end after a very quick tire-smoke at the step. Race Recap: Richie Crampton and the debut of the DHL Top Fuel Dragster had a great run first round of eliminations, but it wasn't enough to get past his opponent. Leaving the starting line, Crampton had a slight advantage with his .053 reaction time, but Terry McMillen career-best run took the win.